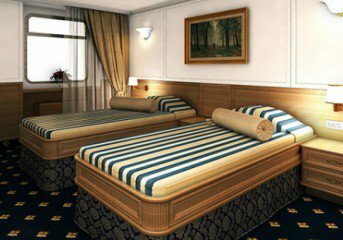 Have the time of your life while discovering the best of Russia aboard the boutique MS Volga Dream. 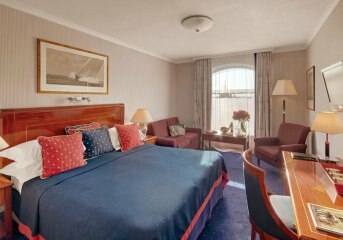 This premium cruise has it all: best tours of Russia's major landmarks, 5-star accommodation in the very heart of Moscow and St. Petersburg, as well as rich entertainment on board and unique local experiences. After check-in, you can meet your guide and fellow travelers during a warm-up meeting at the hotel lobby from 6 p.m. to 9 p.m. The rest of the evening is free, so you can either explore the fantastic center of Moscow on your own or take a good rest before the rich sightseeing program planned for the following day. Following breakfast, you enjoy an orientation city tour of Moscow and see the city's rich variety of building styles and go inside the Cathedral of Christ the Savior (if time and availability permit). Later you proceed to the most picturesque monastery in Moscow, Novodevichiy Convent, to see its cemetery that is considered one of Moscow’s most prestigious resting places. Many famous Russian political leaders, actors, scientists, poets and musicians are buried there, including Mstislav Rostropovich, Mikhail Bulgakov, Anton Chekhov, Vladimir Mayakovsky and Boris Yeltsin. The cemetery has a park-like ambiance, dotted with small chapels and beautiful monuments, that makes you feel like strolling in the park of sculptures. After the tour, you return to your hotel. The rest of the day is free, so you can continue exploring Moscow on your own. This day is dedicated to the exploration of one of the most outstanding Moscow icons - the Kremlin. Following breakfast, you meet your guide at the hotel lobby and go inside the Kremlin walls to visit its famous Armoury Chamber that houses a unique collection of crown jewels, stunning coronation finery, hand-forged armor and weapons, royal carriages and sleighs, and world-famous Fabergé eggs. Then proceed to Moscow's famous Red Square to see its well-recognized landmarks. You see Lenin's Tomb, the iconic St. Basil's Cathedral and visit GUM, Moscow’s largest department store. After the tour you return to your hotel and have the rest of the day free. Following breakfast, you check out from your hotel. You then enjoy a guided tour to the world-famous treasure trove of the Russian fine art, the Tretyakov Gallery, where you spend amazing time viewing the gems of its collection, including the famous masterpieces of Ivan Aivazovsky, Mikhail Vrubel and Viktor Vasnetsov. Then you explore one of the most interesting city sites that is located deep beneath the surface - the Moscow Subway. You have a quick subway ride to taste local life and enjoy the splendid Soviet decoration of its stations. After the tour, you are transferred to the river port to board your luxurious MS Volga Dream and receive a warm welcome with a traditional Bread, Salt & Vodka Ceremony. In the evening you are invited to the Captain's Welcome reception and dinner on board. Note: in the 2020 tour itinerary, the touring program starts in the afternoon. After a full day of cruising along the picturesque sceneries of the Russian countryside, you arrive in the small Russian Golden Ring town of Uglich, where a historically significant political turmoil known as the Times of Trouble started. During your city tour of this renowned Golden Ring town you visit the famous Church of St. Dmitry-on-Blood, built on the site where Ivan the Terrible's son, Dmitry, was murdered in 1591, and the St. John's Church where you enjoy a fascinating concert of choral music. After the tour you return on board your ship. In the evening you can join a Costumed Russian Tea Ceremony and Russian Cooking Class. During your guided city tour you explore the Spassky Monastery where you see the icon Transfiguration of the Savior, visit the wonderful Church of Elijah the Prophet with incredible mosaic decoration, and participate in a costumed reception at the governor's house. This day is dedicated to the exploration of Goritsy - a tiny picturesque settlement near White Lake. Your guided tour includes a visit to the Ferapontov Monastery*, a noted UNESCO World Heritage Site with magnificent frescoes by Dionysius, one of Russia‘s most renowned icon painters. He painted the temple ceiling about 10 years before Michelangelo even started on the Sistine Chapel! After the tour you return on board your cruise ship and enjoy Russian Dinner with Vodka tasting party. Note: in the 2020 tour itinerary, the touring program includes the Kirillo-Belozersky Monastery instead of the Ferapontov Monastery. Today you arrive in the stunning Kareliya region, noted for its vast wilderness and beautiful nature. Here you see a real miracle of wooden architecture - the fantastic Kizhi Island. During your walking tour you see its famous Pogost including the dazzling 22-domed Transfiguration Church built without a single nail, beautiful windmills and ancient Russian wooden houses. After returning to your ship you enjoy the Piano Concert consisting of pieces by Tchaikovsky and Rachmaninoff. Today you explore Svirstroy - a small charming village located on the 139-mile-long Svir River. Here you invited into a local resident‘s home where welcoming Svirstroy villagers offer tea with jam and pirozhki (local pies). You get to learn about Russian traditions and lifestyle and see the attractions of Svirstroy. After tea hop on a bus for a tour of the nearby town to see the monument of the WWII followed by a visit to a local primary school. You then return to your ship and have a farewell dinner in the evening. After breakfast you arrive in the Northern capital of Russia and disembark your cruise ship. Your guide meets you at the river port and takes you on an amazing panoramic city tour around the most cherished gems of St. Petersburg. During the tour you drive along the bustling Nevsky Prospect abundant in fine shops, cafes and museums, take a walk through the Split of Basil Island, and enter the Peter and Paul Fortress - a burial place of almost all the Russian emperors and empresses from Peter the Great to Nicholas II and his family. You have photo stops near the gorgeous Church of Savior on Spilled Blood and St. Isaac's Cathedral. After the tour you are transferred to your luxurious 5-star hotel for check-in and have the rest of the day free. Following breakfast, you meet your guide at the hotel lobby and go to one of the best and largest art museums in the world, the Hermitage Museum, before hours to avoid large crowds. The Hermitage Museum houses its unique collection of world art, including the masterpieces of Leonardo da Vinci, Rembrandt, El Greco, Francisco Goya and Thomas Gainsborough in the halls of the Winter Palace. After lunch in a city restaurant, you travel to the outskirts of St. Petersburg to explore the former summer residence of Russian tsars and the gem of palace architecture - Peterhof. During the tour you visit one of the authentic Small Cottages and take a walk in the beautiful Lower Park, lavishly adorned with 176 fountains of various forms and styles and numerous gilded statues of ancient gods and heroes. After the tour you return to your hotel* and have the rest of the day at leisure. Note: in the 2020 tour itinerary, a return to St. Petersburg from Peterhof by hydrofoil is included. After breakfast, you have some free time to explore St. Petersburg on your own. In the afternoon you go on a trip to Pushkin (Tsarskoye Selo) to explore the brilliant Catherine's Palace that is a striking example of baroque architecture gifted by Peter the Great to his wife Catherine I. During the tour, you walk through the lavish parks and gardens of this outstanding palace and enjoy its gorgeous interiors, including the replica of the world-renowned Amber Room, one deemed as the "eighth wonder of the world". This is the final day of your amazing Moscow - St. Petersburg cruise. After breakfast, you check out from your hotel and meet your driver who takes you to the airport for your flight back home. We hope you've enjoyed both magnificent Russian capitals and small cities lying in between and return home with lifelong memories and unforgettable impressions. We wish you a safe flight and hope to work on your future trips. Not included: international flights, visas*, personal medical insurance, optional tours and services, all personal expenses. *NOTE: We provide a full visa processing service for US, CA, AU, NZ customers ($298 per person), and application assistance for customers from all other countries ($75 per person). *Note: a complimentary Russian visa invitation is included for the 2020 departures. **Note: The Moscow hotels for the 2020 departures are St. Regis Nikolskaya or Ararat Park Hyatt, and Belmond Grand Hotel Europe in St. Petersburg.